When you land on the island, you will be on a ledge outside of the Nabooti African Museum. Go left and enter the museum. Once inside, go left, off of the platform you’re currently standing on. Go right and talk to the woman standing next to the large statue. She will tell you all about the statue, ask you to find all of the missing jewels for it, and give you a map. Exit the museum and go left until you see a man standing next to a yellow plane. Talk to him, and then get on the plane. Use the plane to travel to Blue Nile Falls. Go right and jump onto a small pile of rocks in the water. Jump onto the larger rock to the upper left, onto the next one, and the next one to the left. Then jump onto the taller one to the upper right, and onto the next one to the left. Jump up once more onto the top of a cliff and there should be a blue flower next to you. Collect it. Go back down, off of the cliff, and go all the way right. Jump up the rocks until you get to the top of the cliff on the other side. There will be a woman there with a chicken, feed, and a fox. Click on her, and she will ask for your help. You will then be in a screen for a minigame. To pass the minigame, first bring the chicken over to the other side by itself in a basket. Take the chicken out of the basket and leave it on the left side. Bring the basket back over to the right and pick up the fox. Bring it to the other side with the chicken. Before you leave the fox and the chicken, pick up the chicken and bring it back to the right. On the right side pick up the chicken feed and put the chicken down. Bring the feed to the left and put it down with the fox. Go back, get the chicken, and bring it to the left and you will have won the game. As a reward she will tell you about a cave behind a bush. Exit out of the game and go right, off of the cliff. Depending on where you land, there will be a big bush to either the upper or lower right of you. Click on the bush, and it will fade, revealing a cave. Enter the cave. Go right, and there will be thin pillars that you will need to jump across. Go quickly, because there will be spikes that will fall over certain pillars. If you fall, go left, back up, and start again. Once you get all the way across, there will be the purple Nabooti jewel. Collect it, exit the cave, and go back to the plane. Go to Mountains of the Moon. Go left, and watch out for goats and falling boulders. Swim across the water and keep going left. There will be a platform that you will need to let a goat knock you up onto. 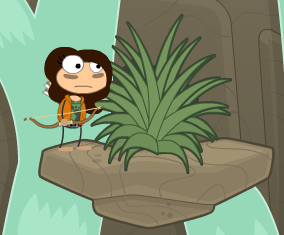 Once on the platform, jump onto the trees and go right until there are no more trees left and jump onto the platform above you. Go left and talk to the lady standing there. She will tell you about the cactus fig to the upper left. Go right, jump across the waterfall, and keep going right. 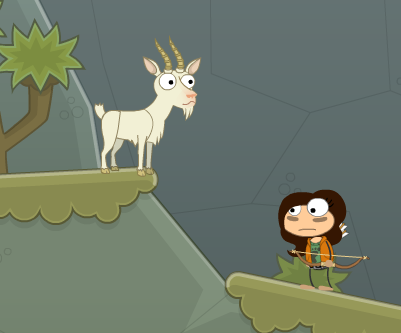 Jump onto the platform above you and go left, watching out for the goat in the middle. Keep going and collect the cactus fig. In the process, you will fall down and need to repeat what you just did to get to where you were. Instead of collecting anything this time, go up to where it’s snowy. Make your way through the snowy areas until you see a man standing in front of a cave. He will challenge you to a game called mancala. Once you win the game, the man will let you in the cave. Enter the cave and go to the bottom. There will be a cellphone to the very right. Collect it, and go back to the top. This cave is similar to the last one, where you had to jump across the thin pillars. Once you get to the other side, there will be the red Nabooti jewel. Collect it, exit the cave, and go back to the plane. Go back to Nabooti. Go right, and click on the woman wearing orange. Trade her your Egyptian blue lily for a desert turban. Put on the turban. Go back to your plane and fly to Cairo, Egypt. 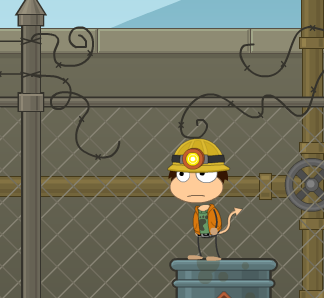 Go right and talk to the first poptropican you see. He will give you a shovel. On the handle of the shovel will be a phone number: 555-6789. Find your phone in your inventory and dial the number. The man to the side will go in his tent and dig for his phone, and the two tomb raiders will flee. Go right and click on the bag, and a moonstone will be added to your inventory. Go back to the Sphinx and climb to the top of it. Use the moonstone. A beam will shine down to the door and it will open. Enter the Sphinx (you may now take off your turban if you want). Go right and there will be a plaque on the wall with four stick things, one vertical. Click on it, and think of the sticks as numbered 1 through 4 from left to right. Click on #3, then #2, #4, #1, and #2 in that order. Jump onto the platform to the upper right and keep going right to the other side. Go right. 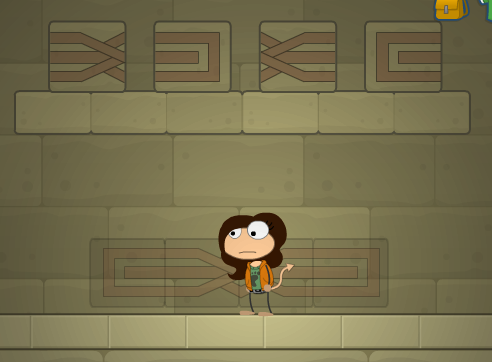 Go up the tiny platforms and you will be in a room with blocks that you will need to put in the right order. Number the blocks from 1 to 4, going from left to right. Push block #4 off of the platform and all the way to the left. Then, push block #1 off the platform and all the way to the left, but not to the left of block #4. Push block #2 off of the platform and all the way to the right. Then push block #3 off of the platform all the way to the right, but not to the right of block #2. Push all of the blocks together in the faded area under the platform and a wall will lift up, letting you through. Push one of the blocks over to the left so that you can reach and jump up and go left. Jump down the tiny platforms and go left. Jump onto the platform with a person on it. Now jump onto the platform with what looks like a capsized boat, then onto the one with a bird next to a cane and next and eye over a basket. Jump up onto the tan platforms and go left until you come across a rope. Climb up the rope and get off of it to the right. There will be four levers. Number them 1 to 4 going left to right. First pull number 4, then 2, 3, 1. The sarcophagus in the center and reveal the blue Nabooti jewel. 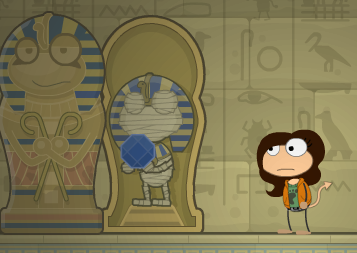 Collect it, go all the way left, down the hole, and exit the Sphinx. Go back to the plane and go to Kaya Forests. Go right, jump onto the frame with animal fur on it, and jump onto the hut to the far right. In a tree to the upper right will be a gold nugget. Collect it. Get back on the ground and use the cactus fig. A giant turtle will get up from where he was sleeping and go eat it. Go back to where the turtle was sleeping and use your shovel. Two ghosts will appear next to you and you will also collect an ebony elephant. Talk to the ghost with the mask on, and he will ask you to get them a sacred fingo. Go back to the plane and go to Nabooti. Scroll down and have a look at his page. It will be filled with bad pictures of animals with the wrong name. Close out of the computer screen and exit the Internet Cafe. 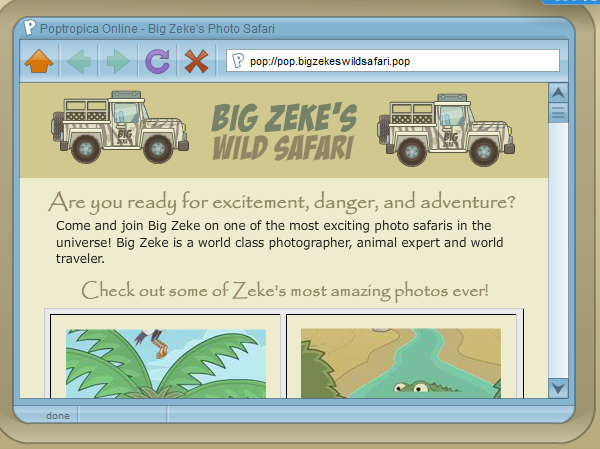 Go right and talk to a man standing under a sign that says “Big Zeke’s Wild Safari.” He will ask for your help taking pictures. He will drive you to an area, and you will need to use your digital camera to take good photos of 7 different animals. When you’re done, close out. He will give you a hardhat from when he worked in the diamond mines as a reward. Put on the hard hat and use the plane to fly to the diamond mines. Go right, and run up the dirt pile. Keep going down the pile on the other side, go right, and click on the timer on the large power box all the way to the right. That will shut the power off, but you will have to move quickly. Run back up the dirt pile until you get to the very top, then jump onto the large platform right above you. Run right until you fall off, keep going right, jump on the barrel and enter through the hole in the barbed wires. If you run out of time go back and start the timer up again and try again. Once you’re inside go left and climb up the ramps. There will be carts rolling down the ramps, so be careful and jump either over them or onto them (for a very small amount of time) until you get to the top of the ramps. There will be a hole that the carts are coming out of. Enter the hole. To your right will be a box with a green button and sparks coming out of it. Click the green button and the sparks will stop. To your left will be a barrel of explosives. Push the barrel right until a large rock keeps it from going any further. Go back and press the button. The sparks will follow a trail of the inflammatory liquid that came out of the barrel and it will blow up the rocks. Go back and turn the sparks back off. Another barrel will have appeared. Push the barrel until a wall keeps it from going. Go back and turn the sparks back on and the barrel will blow up the wall. You may now go through. Go right and there will be a mine cart on a trail. Push the mine cart and you will hop in. There will be many obstacles for you to dodge. When the track starts going up, duck. When the track goes down and you see a sign, jump. If you fall in you will need to start over. Once you get to the other side, go right and jump onto platforms until you get to one with a pile of diamonds on it. Use the magnifying glass in the corner to look closely at them and find the white Nabooti jewel. The jewel will be the one with a symbol carved into it. Once you find it, exit the diamond mine via the rope above you, go back to the plane and fly back to Nabooti. Go right and enter the museum. Talk to the lady who was standing next to the statue before. She will ask you to put all of the jewels in the right order and give you clues to help you. The jewels should go back in this order. The Nabooti statue will awaken and thank you for giving its jewels back and helping it return to its extraterrestrial home. It it will then launch into space, and the woman will present you will the Nabooti island medallion.